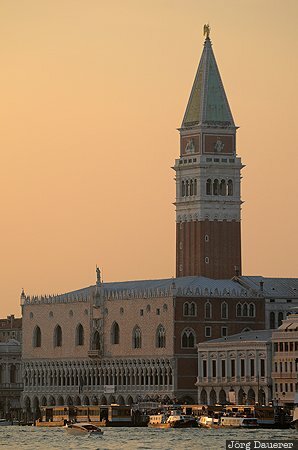 The Doge's Palace (Palazzo Ducale) at St Mark's Square (Piazza San Marco) in Venice in front of the dominating St Mark's Campanile illuminated by warm evening light. Venice is in Veneto in northern Italy. This photo was taken in the morning of a sunny day in October of 2011. This photo was taken with a digital camera.